A recent Zimbabwean joke had it that ‘if the four horsemen of the Apocalypse had not already arrived, then there were some very good imposters about’. It is not a very funny joke unless one is suitably seeped in the mordant despair experienced by those of us struggling on in pursuit of ‘the normal life’ in failing states, ‘low intensity’ civil wars and economic meltdowns. There are others of us facing earthquakes, storms and tsunamis. Social psychology has long recognized the behavior of the ‘bystander’ as being heavily inflected by contradiction and focusing on appeals to others ‘to do something’. Suffering of epic proportions and horrifying details has become a daily diet of shock and sorrow through every imaginable media source and it was Susan Sontag who began to explore for us the consequences of a constant, inescapable ‘regarding of the pain of others’ (2003). The banal horrors of disasters, natural and man-made, and the scale and intensity of suffering they give rise to have become constantly present to us, while being also curiously peripheral.To risk understatement, these are forms of social suffering that are in urgent need of detailed study. 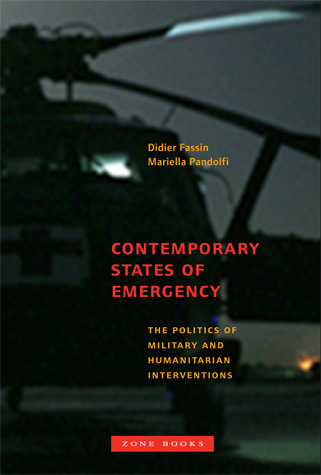 ‘Contemporary States of Emergency: the politics of military and humanitarian interventions’, edited by Didier Fassin and Mariella Pandolfi (2010) is a volume which brings together an extraordinarily broad range of scholars and activists, writing on a very wide range of topics which are framed by Fassin and Pondolfi’s impressive legal survey of the gradual development of ‘the state of emergency’ as an example of Agamben’s (1995) notion of the ‘state of exception’. “The state of exception thus forms the basis for a government that is at once military and humanitarian, resting on a logic of security and a logic of protection…. [and] is inscribed in a temporality of emergency…. [it] derives from a desire to intervene, and it increasingly appears that compassion for far-away suffering and its translation into the moral obligation to act has become on of the strongest political emotions in contemporary life” (Fassin and Pandolfi, 2010: 16). It is worth pointing out that this is the view from above, from the position of interventionist. The perspectives and experiences of those intervened upon are notoriously difficult to capture in academic reflection and the forms of writing they generate. It is thus not too surprising that they are largely absent here. It is also an unjust criticism of the book which, after all, tells us it is concerned with ‘the politics’ of the emergency, and the interventions partially provoked by it. This is a work of reflection on the politics of interventionism as practiced in our world’s power enclaves. Fassin and Pandolfi begin their survey, substantively, in the reinvigoration of the United Nations and of the contradictions inherent in international law since the appalling destruction of the Second World War and the challenges of the newly postcolonial states. The elephant in the room here (as it is in so many rooms, still) is the Holocaust where humanitarianism and intervention were so conspicuously absent, and suffering so absolute. The formulations that attempt to hold the book together may have been greatly enhanced had they registered the roots of late 20th century humanitarianism in the utter failures of those unspeakable events. Guilt, as Freud insisted, is the essential human drive in conscious motivation, and military and humanitarian interventions are nothing if not examples of the performance of conscious (and consciously ethical) motivations. This long shadow aside (if such be possible), this is a book full of remarkable, if uneven, insights. Besides detailed analyses of the political rituals and elaborations surrounding ‘transnational’ interventions, we also have case studies from (amongst others) post-tsunami Indonesia, Uganda, the Balkans and Venezuela. I was especially drawn to Ugo Mattei’s delightfully acerbic recognition of an ‘emergency-based predatory capitalism’. There is impressive frankness here. Language itself is at stake, as perhaps it should be in so strangely new a landscape. I have already mentioned the weighty ironies of phrases such as ‘low intensity civil war’, but there are also ‘compassionate militarization’ and ‘an emancipatory imperium’, to name but a few. Still, the development of relatively stable languages with which to refer to disaster with any recognizable sense of justice having been done is a sufficiently complex task to forgive some clumsy beginnings. Gilles Deleuze (1993) remarked that it was the stutter, the slippage of language, which marked a point when utmost failure and creativity became simultaneously possible. Without a doubt, the highlight of the book for me was George Marcus’ ‘Experts, reporters, witnesses: the making of anthropologists in states of emergency’ which would make valuable required reading in anthropology departments globally, for large swathes of the globe are now revealed as sites of potential and actual disaster, of social suffering and, in Arendt’s phrase (1963), of ‘the banality of evil’. In Marcus, a reflexive anthropological voice allows us to glimpse part of the contradictions awaiting all witnesses (perhaps all the disaster-struck). Such contradictions might include the emotional freight accompanying the disaster, the problem of who might be addressed by the witness and in which language and the confounding problems inherent in the fact that interdisciplinary engagements (such as that represented by this book) are babels of wildly different methodologies, temporalities and languages. In ‘The Writing of the Disaster’ (1980), Maurice Blanchot appears to suggest that the disaster is less narratable event (or social configuration) than standing question to philosophy. It becomes increasingly clear though that we need all means possible in a scholarly apprehension of disaster, of ‘contemporary states of emergency’: philosophically sound questions, divergent methodologies, multiple voices. Indeed, stutter and babel. We find some of that here in this compelling volume. Agamben, Giorgio. 1995. Homo Sacer: sovereign power and bare life. Stanford, Stanford University Press. Arendt, Hannah. 1963. Eichmann in Jerusalem: a report on the banality of evil. London, Penguin Classics. Blanchot, Maurice. 1980. The Writing of the Disaster. (trans A Smock). Lincoln, University of Nebraska Press. Deleuze, Gilles. 1993. Essays critical and clinical. Minneapolis, University of Minnesota Press. Sontag, Susan. 2003. Regarding the pain of others. London, Hamish Hamilton. Parsons R. Contemporary States of Emergency. Somatosphere. 2010. Available at: http://somatosphere.net/2010/contemporary-states-of-emergency.html/. Accessed April 25, 2019. Parsons, Ross. 2010. Contemporary States of Emergency. Somatosphere. http://somatosphere.net/2010/contemporary-states-of-emergency.html/ (accessed April 25, 2019).